For use where electrical plug-in is available. Recommended for clean to overgrown fences. 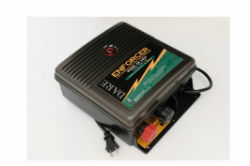 110 volt- Most output for your money spent. Costs pennies a day to operate. Pulsating Low Impedance - small size, big performance. Recommended use for goats, cattle/cows, sheep, llamas, horses, deer and pigs. Controls up to 600 acres overgrown fence. Outperforms 100 mile energizers.